Choosing your wedding reception table decorations is key to your reception's decor they are the part that will wow your guests when you get it right and also the bit that will easily break your wedding budget. 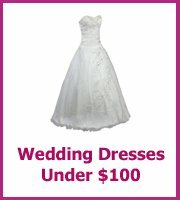 Then again most areas of your wedding are easy to overspend at! You want table decorations that will add a magical element to your reception venue and there is no better way to do that than have candles. 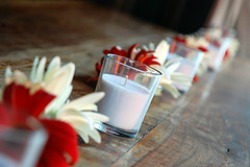 Candles can make anywhere feel special, plus they fit with every wedding theme that you can think of. If you have long rectangle tables for your guests you will want your table decorations along the length of the table, depending on the length you will want at least 3 decorations to balance the table. You can buy candle bags or Luminaires as they are sometimes called that are made from fire retardant paper, you can buy them for less than a dollar a bag, normally in packs of 10. They look stunning when you light them with tealights from inside the bag. The design shines through and you really don't need anything else on the table. If you do want to add some color then look at ivy draped between the bags or petals on the table. A line of glass votives also has a simple and modern look, you could alternate with fruit such as lemons or limes or apples for a clean modern look and also flowers or petals. The fruit also works really well just by itself, a long line of lime green apples or lemons and limes are fantastic combinations. This style works best on long tables, if you were looking for a similar effect on a round table you will need to group the candles and flowers together in the center. Or you could look at having a ring around the center with the candles and flowers. In the center of the ring you could have the table number, the wine or a pyramid of favors. a 5ft round with 10 people on won't have much space for an elaborate centerpiece unless you have height rather than width. Whereas a 6ft round with 10 people on will have a fair amount of space to fill. If you have rectangular tables or 'longs' then you will have lots of space one way and not much the other, in other words you will need to have long centerpiece designs. 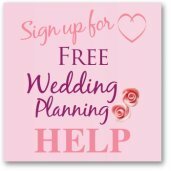 Have a chat with your venue so that you can see how much room you have. 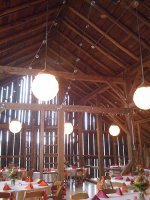 Ask to see a room laid for another wedding, they will happily show it to you before the wedding party arrives. The other consideration is the amount of other stuff on the table; menu, wine, water jugs, glasses and place settings. I have seen tables where the centerpiece is lost behind all the other extras. 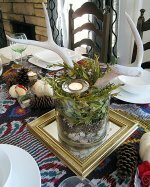 Before you go very high think how your guests will see each other at the table, the only way to test this is to make a mock up of the centerpiece and then sit at a table with it. Can you see your opposite guest? The top table? It is worth remembering all of the other pieces that will be on the table as your tables can quite easily end up cluttered. When you plan your decorations don't forget about the table numbers, wine bottles, jugs of water, menus, and favors. They all play a part in the overall look. If you are having round tables for your guests you will want the wedding reception table decorations grouped in the center of the table. Add different heights to your centerpiece to make it look more interesting, this can be done with different heights on your candles or vases or even raise the whole of your centerpiece by placing it on a box that is under the tablecloth. 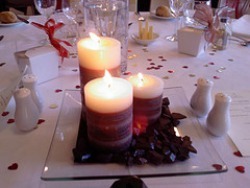 Your centerpiece will also look better if you use an odd number of candles or vases, rather than an even number. So you will want 3 or 5 of each of the main part. 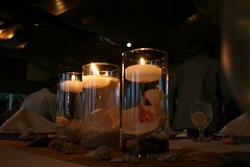 Modern candle centerpieces are floating candles in clear glass cylinder vases. You can fill the base of the vase with a flower or petals or pebbles, then fill with water and place the floating candle on the top. Have your floating candle the same size as the cylinder so it does not float to one side. You can also pick up quite cheap lanterns that you could have in the center of the table, if you find ones that are decorative enough you would not need much else. Ebay is a good resource for buying lanterns in bulk. Another really cheap but effective centerpiece are homemade centerpieces from tin cans!